A tower at the Visitor Centre for the Bruce Peninsula National Park and Fathom Five National Marine Park in Tobermory has a beautiful view where you can enjoy the scenery of the islands. Fathom Five National Marine Park in Tobermory, Ontario has some beautiful scenery from the tower at the visitor centre, but more importantly, these deep blue waters are home to Canada's first National Marine Conservation. Amongst the rugged islands to the north and east of Bruce Peninsula, there is evidence and stories relating to 20 or more shipwrecks and numerous historic lighthouses. The visitor centre is a new addition for these two national parks where the 65' foot tower is located, a high definition theatre, an exhibit gallery, a gift shop and a map for those who want to explore the outdoors of Fathom Five National Marine Park by hiking the Bruce Trail. View of the islands of the Fathom Five National Marine Park from the tower at the Visitor Centre for the Bruce Peninsula National Park and Fathom Five National Marine Park, Tobermory, Bruce Peninsula, Ontario, Canada. 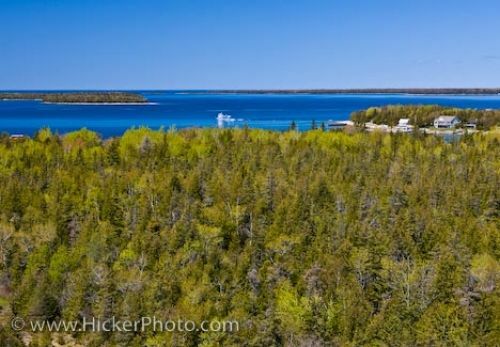 Picture of the scenery overlooking Fathom Five National Marine Park in Tobermory, Ontario from the visitor centre.